Looking for best Hong Kong Hotel? We don't recommend a Hong Kong hotel as we do not own or we're not directly connected to any of them, only, what we do is to tell you to which hotel usually a Hong Kong traveler prefers to stay based on actual testimonials from our site's visitors and verified HK hotel guest reviews. - Situated central to many area attractions, the Royal plaza HK is located in the Kowloon district. Guests of this Hong Kong accommodation will enjoy close proximity to area attractions, such as Nathan Road, the Ladies' Market, Bird Garden, the Flower Market, Goldfish Market, and Night Market, the business district, and several shopping centers. Amenities offered by the hotel include a swimming pool, a fitness center, massage services, a restaurant, a bar, business and meeting facilities, a bakery, 24-hour reception, laundry service, and a ballroom. The Royal Plaza Hong Kong is located adjacent to a mass transit station and is walking distance to a train station. The international airport is approximately 40 minutes away, and guests can make use of a shuttle or car service to and from the airport. The nearly 700 rooms of the Royal Plaza hotel in Hong Kong include many amenities, such as kitchenettes with refrigerators, microwaves, tea and coffeemakers, and hot plates. Further room amenities include flat screen televisions and high-speed Internet access. 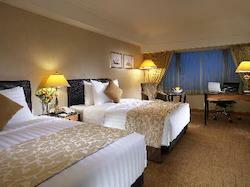 The Royal Plaza Hong Kong Hotel is conveniently situated central to many of the city attractions. Shopping, dining, and entertainment are all close by. Book a room at Royal Plaza Hong Kong. - Located central to many areas of the city, the Marco Polo HK is within walking distance of area attractions, including Kowloon Park, the Hong Kong Museum of Art, the Space Museum, Star Ferry, and the Tsimshatsui shopping district. The hotel is a part of the Harbor City, a large shopping center in Hong Kong. Amenities offered by the hotel include seven restaurants, conference, function, and banquet rooms, a swimming pool, and currency exchange. The hotel also offers concierge, room, and currency exchange services. The Marco Polo Hong Kong is situated centrally to the city's shopping and attractions. A harbor ferry is within moments from the hotel, and local transportation options are close by. Many of the rooms at the Marco Polo Hotel in Hong Kong afford views of Victoria Harbor, which includes a nightly light show on the local buildings. Other amenities offered by the rooms of the hotel include air-conditioning, telephones, bathrooms, and data ports. Continental Club rooms feature butler service, complimentary coffee, tea, cocktails, in-room safes, shoeshine service, and cable television. 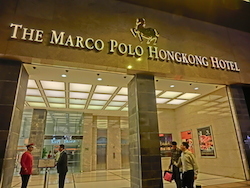 The Marco Polo Hotel Hong Kong is conveniently situated as a part of the Harbor City shopping center, providing guests easy access to shopping, dining, and attractions. Book a room at Marco Polo Hotel Hong Kong. - Many area attractions can be reached from the L Hotel Nina hong kong. These attractions include Disneyland, Tsuen Wan Park, Town Hall, Mongkok, Yuen Yuen Institute, Tsuen Wan Shopping Center, and the Tsimshatsui shopping area. The hotel is surrounded by the Tsuen Wan shopping district. 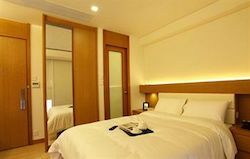 The Nina hong kong is thirty minutes from the Hong Kong International Airport, and is just a short walk from a rail station and a mass transit station. The 1589 rooms of the L'hotel Nina Et Convention Center include many modern amenities, such as coffee/tea makers, hairdryers, high-speed Internet access, televisions with on-demand movies, irons and ironing boards, in-room safes, private bathrooms with bathrobes, and laundry service. The L'hotel Nina Et Convention Centre is a 42-story accommodation with 1589 contemporary rooms. The hotel includes two towers, connected with a sky bridge at the 41st floor, where guests can enjoy views of the sea. The hotel provides such amenities as a swimming pool, a sauna, a restaurant, a business center, a lounge, and a banquet hall. Book a room at L'hotel Nina et Convention Centre Hong Kong. - Situated conveniently near the very heart of the city, the Hotel Nikko Hong Kong sits near Victoria Harbor. Guests will find that this accommodation in Hong Kong is also close to many area attractions, including the Science Museum, attractions at the harbor, and Kowloon. Guests will find that the amenities of the hotel include seven restaurants, bars, a swimming pool, a tour desk, a banquet room, a fitness center, 24-hour reception, and air-conditioning throughout. The Nikko Hong Kong is approximately 45 minutes from the Hong Kong International Airport, and is walking distance from a rail station. The hotel offers guests complimentary local shuttle service. 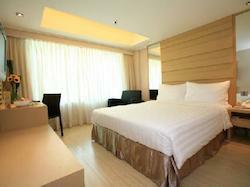 Guests will find that the rooms at the Hotel Nikko HK include many amenities. The amenities offered at this accommodation include private bathrooms with hairdryers, air-conditioning, and flat screen satellite television with pay-per-view movies, minibars, coffeemakers, refrigerators, direct dial telephones, and broadband Internet access. The Hotel Nikko in Hong Kong provides guests with views of the Victoria Harbor skyline, and is just minutes away from one of the city major shopping district, Tsimshatsui. 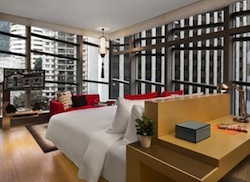 Book a room at Hotel Nikko Hong Kong. 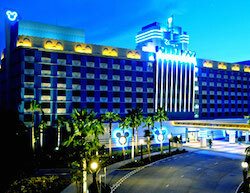 - This Hong Kong hotel is a part of the Disneyland complex. The other attractions popular with visitors to Hong Kong include the Clock Tower, the Night Market, the many commercial and business addresses and the cultural attractions that define the city. Hong Kong International Airport is located only 6 miles away from this hotel. There is extensive public transit within the city itself. There are 400 rooms available at this hotel, as well as a number of suites. In addition to the themed services and amenities made available to guests of the Disneyland Hotel Hong Kong, there are minibars provided in all of the rooms. The principal amenity provided to guests of the Hong Kong Disneyland Hotel is the immediate proximity to the Disneyland theme park. The hotel is themed after the park, with bedtime television stories and wake up calls from Mickey Mouse himself being available to guests. There are two restaurants at this establishment and a lounge. There are also shops on the premises. Book a room at Hong Kong Disneyland Hotel. 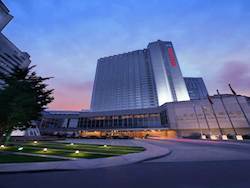 - The Regal Oriental is conveniently located close by to Victoria Harbor, shopping centers, and the business district of the city. In addition, the hotel provides direct access to the Clear Water Bay Country Club. Area attractions include Sung Wong Toi, Kowloon Plaza, Lion Rock Road Market, the Hau Wong Temple, the Wing Tai Sin Temple, the Chi Lin Nunnery, Hollywood Plaza, the Hong Kong International Trade and Exhibition Center, the Bird Garden, the Jade Market, and the flower market. Guests looking for shopping will enjoy close proximity to Nathan Street. The Regal Oriental Hong Kong provides guests with a shuttle service to and from the airport, which is approximately forty minutes away from the hotel. There are four hundred guestrooms at the Regal Oriental Hong, including twenty-one suites. Each room includes such amenities as minibars, private bathrooms, air-conditioning, cable television with on-demand movies, and soundproof windows. The modern amenities of the Regal Oriental Hotel in Hong Kong include two bars, a business center, meeting space, five restaurants, a coffee shop, and a laundry service. Book a room at Regal Oriental Hotel Hong Kong. - Located in the center of the city's shopping district, Tsimshatsui, the Golden Mile HK provides guests with access to the many shopping, entertainment, and dining attractions of the city. Many large shopping centers are less than a mile from the hotel, providing guests with easy access. The hotel provides many amenities, such as restaurants, a fitness center, a swimming pool, a salon, a bar, meeting rooms, a ballroom, a gift shop, and a florist. The Golden Mile Hong Kong is forty-five minutes from the Chek Lap Kok International Airport, and is a just a short walk away from a mass transit station and the Star Ferry Terminal. The rooms at the Golden Mile in Hong Kong offer many amenities. These amenities include satellite television, a DVD player, high-speed Internet access, bathrobes, slippers, hairdryers, minibars, refrigerators, coffeemakers, and complimentary newspapers. Suites and executive suites are available to guests. Equipped with modern conveniences, the Holiday Inn Golden Mile is located within the city shopping area of Tsimshatsui in Kowloon. Book a room at Holiday Inn Golden Mile Hong Kong. - The Gateway Hotel Marco Polo is located on the waterfront, overlooking Victoria Harbor. Guests will find that shopping and entertainment venues are just moments away since this Hong Kong accommodation is a part of Harbor City, a major shopping complex. Area attractions close to the hotel include Kowloon Park, the Hong Cong Convention Center, the Museum of Art, the Space Museum, the Cultural Center, and Victoria Harbor. Guests will have access to many hotel amenities, including a swimming pool, babysitting service, 24-hour reception, currency exchange services, a restaurant, a cafÃ©, a hair salon, and a day spa. The Marco Polo Gateway Hotel Hong Kong is close to a ferry terminal, a mass transit station, and the airport express. The airport is less than 30 minutes away. 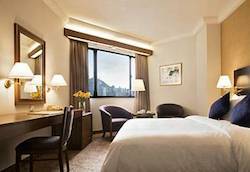 Rooms at the Hotel Marco Polo Gateway Hong Kong include amenities such as cable television, in-room safes, coffeemakers, CD players, and Internet access. Executive suites include complimentary breakfast, afternoon cocktails, butler service, and high-speed Internet access. Situated within one of the city shopping districts, the Marco Polo Hotel Gateway Hong Kong offers modern accommodations overlooking the harbor. Book a room at Marco Polo Gateway Hotel Hong Kong. - Located on Nathan Road, the Novotel Nathan Kowloon is central to the cityâ€™s shopping district. This Hong Kong hotelâ€™s location places guests within walking distance of area attractions, shopping, and entertainment. Other local attractions include the Hong Kong Space Museum, the Clock Tower, the Avenue of Stars, Jade Market, Night Market, and the Hong Kong Museum of History. Guests of the hotel can enjoy amenities including a restaurant and bar, a fitness center, conference facilities, and laundry service. The Novotel Nathan Road is within walking distance of many area attractions, and the Airport Express shuttle is just five minutes away. A mass transit station is also close by, and the Hong Kong International Airport is just thirty minutes away. Guests will find that the rooms of the Novotel Nathan Road Kowloon feature an array of amenities, such as satellite television with on-demand movies, direct dial telephones, coffeemakers, minibars, hairdryers, and air-conditioning. The Novotel Nathan Road Kowloon Hotel Hong Kong is a contemporary accommodation with modern amenities, located within walking distance of area attractions and shopping. Book a room at Novotel Nathan Road Kowloon Hotel Hong Kong. - Hotel Benito on Cameron Road in Tsim Sha Tsui stands in a shopping heaven and enjoys good public transport, with a MTR station just a few steps away. It is located close to Kowloon Park and adjacent to Nathan Road, known as the Golden Mile, famous for shopping and eating into the wee hours of the night. Hotel Benito offers good-quality accommodation at reasonable prices. It is specially designed for discerning travellers by providing a high-quality hotel living environment. All 74 rooms come equipped with air conditioning, satellite TV, telephone, broadband and safety deposit box. Other amenities include laundry, valet parking, 24-hour reception, concierge, currency exchange and doctor on call. Book a room at Hotel Benito Hong Kong. - This hotel is situated in Kowloon, one of the areas of Hong Kong notable for its nightlife. The Hong Kong Shamrock provides convenient access to the city's famous central business district, as well as a host of cultural and commercial attractions. There is a rail station not far from the Shamrock Hong Kong Hotel. The airport can be reached via an express train service. There are trams available throughout the facility. There are more than 150 rooms for hire at this establishment. They are provided with modern amenities, such as cable television service and a minibar. Each room also has a safe deposit box where guests can stash their valuables. Air conditioning is standard in every room. This hotel has a restaurant that serves Chinese cuisine right on the premises. There is also a cafe at the Shamrock Hotel HK that offers simpler meals. Guests who need assistance navigating the local area will find the staff willing to provide that assistance. There are also business services available at this hotel. Book a room at Shamrock Hotel Hong Kong. - This Hong Kong hotel is located near the Polytechnic University and the International Commerce Center. There are also tourist diversions nearby the Casa Hotel HK, including a great deal of shopping and dining venues. Hong Kong's Clock Tower and museums are popular attractions, as well. By car, it is approximately 45 minutes from the Casa Hong Kong to the Hong Kong International Airport. There is also an express train that runs to that facility. There are railway and tram stations nearby this establishment that can provide access to the city at large. All of the rooms at this establishment come with a broadband Internet connection. There are also desks, flat-screen televisions and telephones in all of the rooms at this hotel. Private baths are standard. There is a room suitable for conferences or other gatherings available at the Hotel Casa Hong Kong. The establishment also boasts its own restaurant, in addition to the many nearby. Their staff can provide guests with local information. This hotel has 3-star rated amenities. 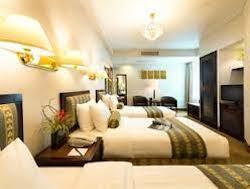 Book a room at Casa Hotel Hong Kong. 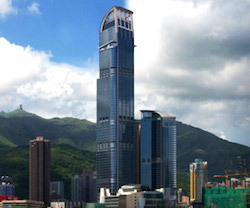 - The shopping district of Causeway Bay is the home of the Holiday Inn Causeway Bay. Guests will be able to enjoy shopping in the district and in Times Square, where they will find restaurants and entertainment venues. Other local area attractions include the Happy Turf Club, the Hong Kong Stadium, Stanley Town, Ocean Park, Disneyland, Lan Kwai Fong, Victoria Peak, and Wan Chai. Five restaurants, two business rooms, a coffee shop, a swimming pool, a fitness center, and a 24-hour reception desk are the amenities offered by the hotel. The Holiday Inn Express Causeway Bay is conveniently close to many types of travel including a train station, a mass transit station, and a metro station. The Hong Kong International Airport is approximately 45 minutes away. 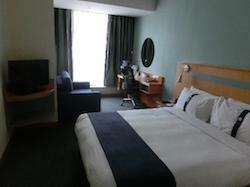 282 rooms comprise the Holiday Inn Hong Kong Causeway Bay. Room amenities include satellite television, direct dial telephones, in-room safes, complimentary high-speed Internet access, and private bathrooms. 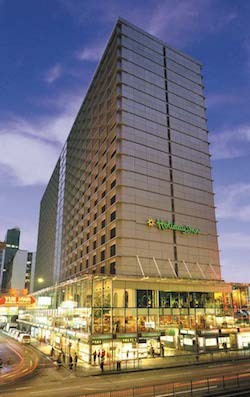 The Holiday Inn Hong Kong Causeway is situated centrally the Hong Kong district of Causeway Bay. The accommodation offers guests easy access to area attractions and includes modern amenities and rooms. Book a room at Holiday Inn Express Causeway Bay Hong Kong. - USA Hostel Hong Kong is highly accessible - MTR (subway) 1 minute walk- KCR (Train) 5 minute walk- Star ferry 5 minute walk- Airport shuttle A21 5 minute walk- Macau Ferry 20 minute walk. It is also in the main tourist spot in city center -- Attractions nearby the hotel include: Hong Kong Cultural Centre- Hong Kong Space Museum- Hong Kong Museums of History, Science Art- Kowloon Park- Temple Street- Victoria Harbor- Stars Avenue- Harbor Plaza. Book a room at USA Hostel Hong Kong. 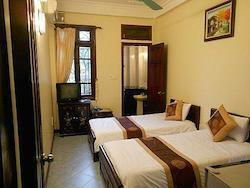 - This property offers a convenient location for backpackers, travelers, and business customers. Many of Hong Kong's bars, restaurants, shopping venues, and major points of interest can be found a short distance from the New Hong Kong Hotel. Various public transportation hubs are located throughout the city, allowing guests of the New Hong Kong Hotel to travel to Hong Kong's various attractions with ease. Book a room at New Hong Kong Hotel. - New International Guest House offers affordable accommodation with FREE Wi-Fi service. It is situated in the heart of Kowloon, TsimShaTsui, the commercial, shopping and entertainment district. It features a full range of personalized services to offer you the highest level of hospitality. It allows you to access all parts of Hong Kong via subway (MTR), buses, Airport Shuttle, taxis and ferries, which are all within walking distance. 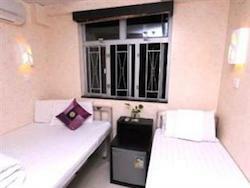 Its facilities are designed to cater to tourists looking for hotel quality at hostel budget accommodation prices. Cleanliness, safety and convenience have the highest priority in our guest house. Book a room at New International Guest House Hong Kong. - This hotel is located in the Tsim Sha Tsui area of the city. There are numerous destinations within walking distance of this hotel. The Temple Street Market is close to the Traveller Friendship Hostel. There are also large shopping malls located nearby, as well as business and cultural attractions. This hotel is steps away from a railway station. The rail system can provide access to the entirety of the city, including the airport, which is accessible via an express line. 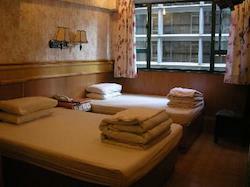 Book a room at Traveller Friendship Hostel Hong Kong. Have a question about Hong Kong hotels/apartments? write it here or you can read reviews and articles below. Do you have a great or even bad story about this? Let others know about it! Is there a Hong Kong hotel rooms available that is good for a family of 2 adults and 2 kids under one year old?